Property taxes clearly have the attention of Texas voters, and not in a positive way, according to the latest University of Texas/Texas Tribune Poll. And they are not particularly happy with business taxes, either. In a state where no taxes are beloved, property taxes are the least beloved of all, according to the latest University of Texas/Texas Tribune Poll. Business taxes, while also unpopular, don’t elicit strong reactions from 39 percent of voters. The results suggest the rationale behind legislative efforts to cut those taxes, like one announced Tuesday by state Senate leaders who want to reduce revenue from those two taxes by a combined $4.6 billion. 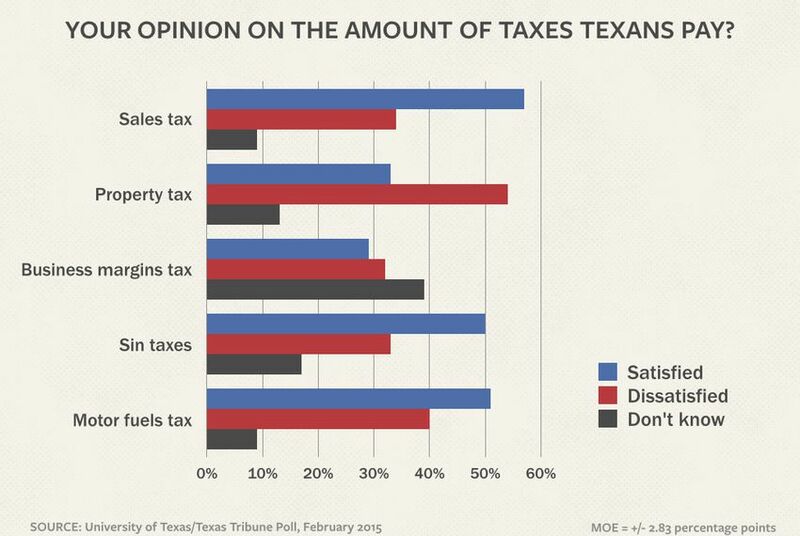 Asked how they feel about the amount of various state and local taxes in Texas, 54 percent said they are dissatisfied with property taxes — and only 33 percent said they were satisfied about those bills. Only one other levy — the business margins tax — found more dissatisfied than satisfied voters. “Property taxes are the whole game — it’s like California in the 1970s,” said Daron Shaw, a professor of government at UT-Austin and co-director of the poll. Contrast the poll findings on the sales tax: 57 percent said they were either very or somewhat satisfied with the amounts of those taxes, while 34 percent said they are dissatisfied. Half are satisfied with taxes on alcohol and tobacco — the so-called sin taxes, while 33 percent were dissatisfied. Motor fuels taxes got favorable notices from 51 percent and unfavorable ones from 40 percent. “Certainly the least popular taxes are property taxes and the margins tax, but with the qualification that Democrats actually want to increase the margins tax and not get rid of it,” said Jim Henson, co-director of the poll and head of the Texas Politics Project at UT-Austin. “There is no subgroup that says they are satisfied with the property tax, including Democrats,” he said. The “dissatisfied” voters were asked whether they think the various taxes should be increased or decreased — an effort to find the source of their dissatisfaction. In all cases, most voters wanted the taxes cut; 91 percent in the case of sales taxes, 93 percent in the case of the property tax and 87 percent in the case of the motor fuels or gasoline tax. In the case of the business margins tax, 27 percent of those who were dissatisfied said they think that tax should be increased; 18 percent said the same about sin taxes. 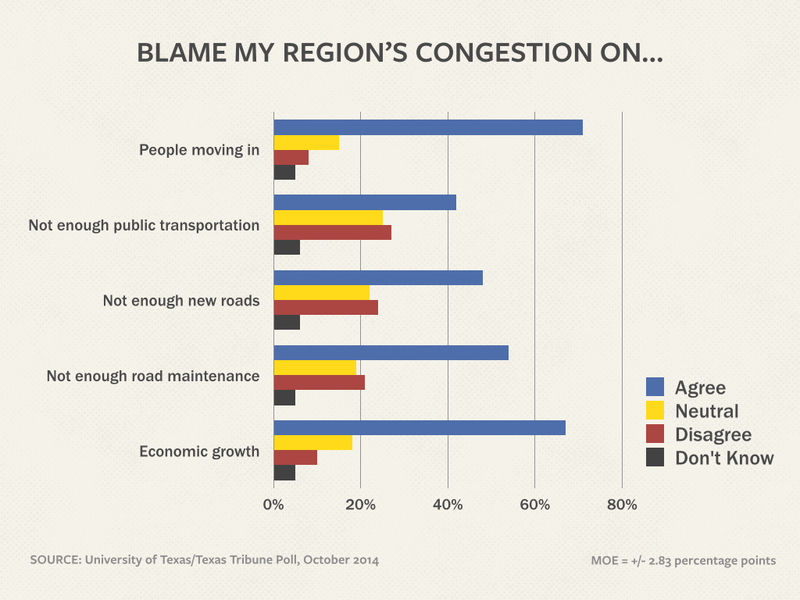 Most — 71 percent — blame their area’s congestion on people wanting to live and work there, and 67 percent attribute it to economic growth. “Growth is a driver, so to speak,” Henson said. Voters were less likely to blame policy decisions. 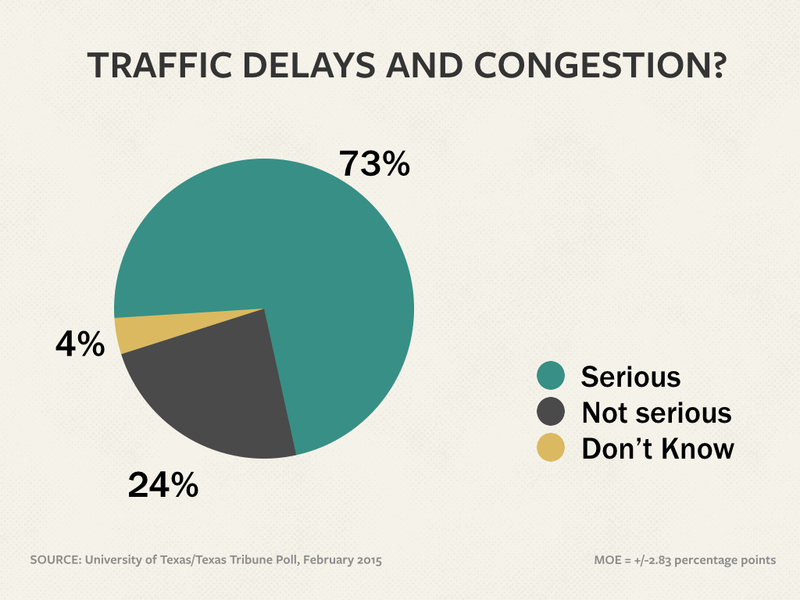 Just over half agreed that insufficient spending on road maintenance adds to congestion; 48 percent said insufficient spending on new roads adds to the problem; and 42 percent agreed that insufficient spending on public transportation is a factor. “It doesn’t matter where you are in Texas, you think we’ve got traffic problems,” Shaw said. “This doesn’t seem to break down on ideological or self-interest lines. They think it’s a problem. The University of Texas/Texas Tribune internet survey of 1,200 registered voters was conducted from Feb. 6 to Feb. 15 and has an overall margin of error of +/- 2.83 percentage points. Numbers in charts might not add up to 100 percent because of rounding. This is one of several stories on the latest University of Texas/Texas Tribune Poll. Monday: Presidential primaries and the mood of the state. Tuesday: Guns, criminal justice, marijuana and the death penalty. Tomorrow: What voters say the Legislature should be doing.